More examples of Philly wrong doings can be found on Keep Philadelphia Beautiful's Facebook page. | Image via http://www.facebook.com/KeepPhiladelphiaBeautifulWhat is a greater faux pas in Philadelphia than calling a hoagie a hero? Questioning the Phillie Phanatic? Ordering crab fries without cheese? The national organization Keep America Beautiful has brought their latest anti-littering campaign to Philadelphia. 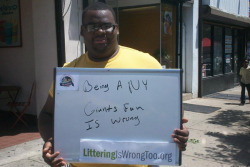 Run by the organization’s local branch, Keep Philadelphia Beautiful, “Littering is Wrong Too” takes a more lighthearted approach to spreading the word on keeping our streets clean. This tongue-in-cheek banner campaign asks locals to write common wrongdoings (both Philadelphia-specific and not) as a comparison to the severity of littering. Common blunders include wearing socks with sandals, marrying a Mets fan, or worse, being a Mets fan. The campaign, which runs until September, is asking for people to write, photograph or video these transgressions, and send them to Keep Philadelphia Beautiful via Facebook, Instagram, YouTube or Twitter, using the hashtag #litteriswrong. For more information, to see other’s photos and videos or to propose your own wrongdoings, visit the Keep Philadelphia Beautiful website (www.keepphiladelphiabeautiful.org) , Littering Is Wrong Too website (http://www.litteringiswrongtoo.org), Facebook page (facebook.com/KeepPhiladelphiaBeautiful), YouTube channel (youtube.com/KeepPhiladelphiaBeautiful), or Twitter stream (https://twitter.com/#!/beautifulphilly).